Mom, dad and baby make…4? Mitochondria–the newest threat to mankind. You get half your DNA from your mom and half from your dad, right? Wrong. You may well have stored in the back of your mind, dusty from disuse, a word from some long-ago biology class: “mitochondria.” You can think of mitochondria as tiny factories in your cells that pump out the energy you need to survive. Each of your cells has many mitochondria floating around in it, and each one comes with its own small set of DNA that you can only inherit from Mom. 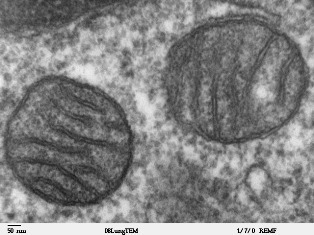 Mitochondria are crucial for survival, so as you might imagine, errors in their DNA can lead to very serious problems. Some disorders linked to mutations in mitochondrial DNA include heart failure, neurological damage, and blindness. Babies born with defects in the majority of their mitochondria almost always die before adulthood. Healthy women can be carriers of fatally flawed mitochondria if their good mitochondria outnumber the bad ones, on average. But some of her eggs might, but random chance, get loaded with mostly defective mitochondria, meaning any baby born from that egg will likely be doomed. These errors are thankfully rare, but there are women who would like to be mothers, but have mitochondrial defects that could be passed on to their children. Wouldn’t it be great if there was a way they could conceive a child, but avoid passing on bad mitochondria? If you saw the New York Times’ Science section last Monday, you may have already discovered that such a thing is actually possible. The problem, as with many groundbreaking scientific advances, is that people are afraid. The scientist who made this breakthrough, Dr. Shoukhrat Mitalipov (Shoe-KHRAHT Mee-tuhl-EE-pov), found a way to remove the nucleus, the home of the cell’s main DNA, from an egg and move it into a new egg with healthy mitochondria. The new egg would already have its nucleus taken out. Then, using in vitro fertilization, a baby could be made that now has three “parents”: mom, dad, and a second “mom” who donated her error-free mitochondria. Now, if you’ve ever seen the movie GATTACA (which I highly recommend if you haven’t), you’re probably of the opinion, as am I, that these are very bad things indeed. But let’s take a tiny step back for a minute and look at what this procedure ACTUALLY does—and what it doesn’t do. It doesn’t create designer babies. Your mitochondria don’t determine your hair or eye color, or how pretty you’ll be. They don’t increase your chance of becoming President one day. In fact, your mitochondria only carry 37 genes in them—far less than the about 25,000 in your nuclear DNA. And this procedure isn’t even picking and choosing which versions, or alleles, of those 37 genes will be in the resulting baby—it only makes sure that specific, life-threatening defects in the mom who will carry the fetus aren’t passed on to her baby. This technique is actually a very blunt instrument. It yanks out the nucleus from one egg, and puts it in another. To make designer babies, as in GATTACA, you’d have to use a much finer set of tools. Making specific changes to genes in your DNA—changing brown eyes to blue, for example—is much more difficult and is nowhere near being a direct consequence of allowing the mitochondria-exchange technique to be used in the clinic. A healthy rhesus monkey born using the technique developed by Dr. Mitalipov. Is the idea of a baby having 3 sources of genetic materials—in effect, 3 parents—kind of weird? Sure. So was the idea of a baby being conceived in a test tube back before Louise Brown, the first “test tube baby” was born in 1978. Now, she and the more than 5 million other people born as a result of in vitro fertilization are proof that just because something seems weird at first doesn’t mean it’s a bad idea. If having 3 biological parents instead of 2 means being born without life-threatening defects, or if having your eggs’ mitochondrial DNA traded for that of a healthy donor’s means being given the gift of motherhood, isn’t that something worth giving a chance? « OMG. Sugar is poison! ?